Fresh from its successful case against Microsoft, the European Commission has turned its attention to Apple and their mysterious exploding iPhones. 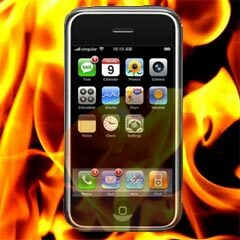 There have been several reports of Apple products exploding or catching fire in the UK, France, Holland, and Sweden. A US television station has also collated evidence of 15 ‘burn and fire-related’ incidents. Both the iPhone and iPod use sealed lithium ion batteries. If the seal is compromised, exposure to moisture or heat could cause adverse chemical reactions. Taking your gadget to the beach may not be ideal! Apple has responded to the EU saying these are isolated incidents and there is not a general problem. Statistically, the company is correct: Apple sell millions of products and a few dozen exploding devices is unlikely to indicate an intrinsic design failure. A recent Japanese Government investigation warned that there may be minor risks but no products were recalled. Apple — there is a simple way to resolve complaints: apologize and fix the problem. Customer feedback is invaluable and complaints are one of the best sources of information. In addition, a customer who has their issues settled is more likely to buy from you again. It’s a lesson for us all.